Encarnacion “Chon” Chavez was born in San Carlos, Mexico in 1856 (a). He was the son of Gabriel Chavez and Micaela Lujan. On April 8, 1858 he married Severa Gomez in Jesus Nazareno Temple in Ojinaga, Chihuahua, Mexico. The couple had six children while living in Mexico, and another in 1904, just after they immigrated to the United States. Chon and Severa may have lived briefly in Lajitas, but by 1905 they had settled in the Terlingua area and remained there until Chon’s death on December 6, 1930. He died of Cirrhosis of the liver and is buried in the Terlingua Cemetery. For three months prior to his death he was treated by Chisos Mining Company physician Dr. E.A. Montenyohl. Severa died in Alpine January 13, 1943 and is buried there. According to the 1920 census, Encarnacion and Severa were United States Citizens by that time. (1) Son Ramon Chavez was born circa 1920 in Terlingua. He was a World War II Veteran. He died at his residence in Monahans, Texas April 9, 2000 and is buried in the Monahans Cemetery. His wife’s name was Sarah and they had five children. a. Son Adolfo Chavez. In April 2000 he was living in Pecos, Texas. b. Son Alfredo Chavez. In April 2000 he was living in Monahans, Texas. c. Son Robert Chavez. In April 2000 he was living in Monahans, Texas. d. Daughter Herminia Chavez. Her married name is Gomez. In April 2000 she was living in Monahans, Texas. e. Daughter Elvira Chavez. Her married name is Almanza. In April 2000 she was living in Monahans, Texas. A. Son Guillermo Urias was born February 19, 1904. He was baptized in Lajitas, Texas April 29, 1904 by Father Brocardus. His godparents were Felipe Castillo and Luz Sanchez. B. Daughter Refugia Urias was born July 4, 1905. She was baptized September 11, 1905 in Terlingua by Father Brocardus. Her godparents were Felipe Castillo and Luz Sanchez. C. Daughter Paula Urias was born May 12, 1907. She was baptized September 14, 1907 in Lajitas by Father Brocardus. Her godparents were Jose Gonzalez and Inez Ramirez. D. Son Jesus Urias, twin of Jose Luis Urias, was born in Big Bend, Texas June 13, 1917. He was baptized in Chisos by Father Brocardus November 5, 1917. His godparents were Dolores Duran and Guadalupe Luna. E. Son Jose Luis Urias, twin of Jesus Urias, was born in Big Bend June 13, 1917. He was baptized in Chisos by Father Brocardus November 5, 1917. His godparents were Dolores Duran and Guadalupe Luna. 3. Daughter Luz Chavez was born December 16, 1891 in Ojinaga, Chihuahua, Mexico. She married Monico Garcia in Terlingua November 4, 1909. They had ten children. Luz died in Loving, NM September 16, 1972. See the Julian Garcia Documented Research Report at http://www.lifebeforetheruins.com/julian-garcia.html for full details. 4. Son Carlos Chavez was born in Mexico in 1895 and immigrated to the United States in 1904. According to the 1920 census, he was a United States Citizen by that time. He married Rebeca Luna May 14, 1916, probably in Terlingua. They were married by Father Manuel Cuadrado. Rebeca was born in Presidio, Texas March 14, 1899, the daughter of Alejandro Luna and Antonio Lujan. (See http://www.lifebeforetheruins.com/alejandro-luna.html for more information on the Luna family.) In 1920 Carlos and Rebeca were living in the Terlingua area where Carlos was working as a mine laborer. He died there around 1921. Carlos and Rebeca had three children. (1) Son Bernabe Ortega was born in Brewster County November 20, 1934 and died the same day. (2) Daughter Irene Ortega was born in Alpine November 20, 1934. (3) Son Gregorio Chavez Ortega was born in Alpine November 17, 1936. (4) Son Pablo Ortega was born in Alpine January 15, 1938. (5) Daughter Gregoria Ortega was born in Alpine November 28, 1939. (6) Son Bernabe Ortega was born in Alpine December 4, 1941. (7) Son Enrique Ortega was born in Alpine December 20, 1943. (8) Son Francisco Ortega was born in Alpine January 29, 1946. He moved to Artesia, New Mexico, where he worked as a farm laborer. He died in an automobile accident in Seminole on November 22, 1963 and was buried in the Artesia, NM Cemetery. B. Son Carlos Chavez, Jr. was born in Terlingua 25 September 1918. He married Trinidad Luitt January 13, 1941 in Alpine. They were married by R.C. Garnett, Justice of the Peace for Precinct 1. Trinidad was the daughter of Bernardo Martinez Luitt and Facunda Gallegos. Carlos and Trinidad had three children, all born in Brewster County. (1) Son Jose Chavez was born April 16, 1942. (2) Daughter Gloria Chavez was born September 17, 1943. (3) Daughter Maria Velia Chavez was born February 26, 1945. C. Son Jose “Pepe” Luna Chavez was born September 25, 1919 in Terlingua. He married Juliana Bermudez April 17, 1939. Juliana died February 2, 1978 and Jose died March 11, 1979. They are buried next to each other in Holy Angels Cemetery. aa. Daughter Lori Fierro was born May 13, 1977.
bb. Daughter Monica Fierro was born January 13, 1986.
cc. Daughter Anna Maria Fierro was born September 3, 1987.
aa. Daughter Dominique Rene Portillo was born November 23, 1993.
bb. Son Michael Joe Portillo was born July 17, 1999.
aa. Son Dennis Jerome Villanueva was born September 19, 1980.
bb. Daughter Julie Ann Villanueva was born August 17, 1982.
cc. Son Preston Villanueva was born February 6, 1989.
aa. Son Brandon Scott Portillo was born December 30, 1989.
bb. Son Jeromy Alan Portillo was born October 18, 1992.
aa. Son Jai Michael Portillo was born May 31, 1995.
bb. Daughter Alexis Portillo was born February 6, 1998.
cc. Son Joseph Ray Portillo was born May 4, 1999.
dd. Son Anthony Julian Portillo was born August 6, 2002.
ee. Daughter Abegail Dakota Portillo was born February 27, 2007.
aa. Daughter Ashley Muniz was born April 17, 1991.
bb. Daughter Kimberly Amanda Muniz was born December 6, 1993.
cc. Son Michael Muniz, Jr. was born February 11, 2000. (2) Son Jose Merced Chavez was born July 19, 1942 in Brewster County. (3) Son Enrique Chavez was born July 19, 1943 in Brewster County. a. Son Arturo Chavez, Jr. was born April 13, 1964. He died June 25, 1964 in Alpine and is buried in Holy Angels Cemetery. b. 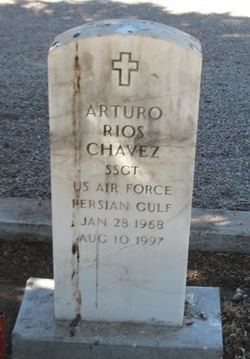 Son Arturo R. Chavez was born January 28, 1969 in Alpine. He served in the U.S. Air Force in the Persian Gulf, achieving the rank of Staff Sergeant. He died in El Paso August 10, 1997 and is buried in Holy Angels Cemetery. a. Daughter Elaine Chavez was born September 25, 1972 in Alpine. In July 2011 she was living in Mesa, Arizona. b. Son Alonzo Adrian Chavez was born December 7, 1977 in El Paso. In July 2011 he was living in Mesa, Arizona. aa. Daughter Kayla Diggs was born April 12, 2001.
bb. Son Lorenzo Diggs was born April 30, 2005.
cc. Son Xavier Diggs was born March 4, 2009.
a. Daughter Julianne Elizabeth Chavez was born April 15, 1983.
b. Daughter Janene Elisa Chavez was born April 11, 1987.
c. Son Aaron Gilbert Chavez was born August 11, 1988. 5. Daughter Isabel Chavez was born in Mexico in 1897. She immigrated to the United States with her family in 1904 and was living with them in the Terlingua area in 1910. She married Jose Baeza Molinar July 2, 1916 in Brewster County. He was born May 31, 1887 in Presidio, Texas, the son of Victoriano Molinar and Jesus Baeza (see http://www.lifebeforetheruins.com/antonio-molinar.html. for more information on the Molinar family). Jose was from a family of freighters, and from 1916 through 1918 he pursued that profession. In the last four months of 1916 he hauled over 53 tons of freight for the Study Butte Mining Company, earning $532.87. In 1917 he hauled nearly 161 tons of freight for the same company, earning $1.694.05, and in 1918 he hauled over 87 tons, earning $1,121.97. However, in the 1920 census his occupation was shown as “Laborer, general” and in 1930 as “Farm laborer”. In 1934 and 1936 he was working for the Chisos Mining Company. In April 1936 he suffered a foot injury when an ore bucket overturned on it. He missed six days work as a result. He received half pay for the time missed. From 1944 to 1965 Jose was a resident of Alpine, where he worked as a bricklayer in the construction industry. He died at his residence in Alpine December 18, 1965 from pneumonia and cancer. He is buried in the Alpine Cemetery. (1). Son Manuel J. Molinar. He was deceased by February 2000. B. Daughter Elisa Molinar was born in Terlingua in 1920 and was living there with her parents in 1930. Her married name was Torres. She was deceased by April 2000. (1) Son Oscar Grado was born May 20, 1941 in Brewster County. In April 2008 he was living in Fort Stockton. (2) Son Adan Grado was born January 24, 1944 in Brewster County. He was living in Odessa in April 2008. (3) Son Raul Grado was deceased by April 2008. (4) Son Manuel Grado, Jr. was living in Presidio, Texas in April 2008. (5) Daughter Rosa Elva Grado was living in Fort Stockton in April 2008. Her married name is Arenivas. (6) Son Jose Grado was living in Hobbs, New Mexico in April 2008. (7) Daughter Maria Grado was living in Fort Stockton in April 2008. Her married name is Dominguez. D. Son Carlos Molinar was born in Terlingua in 1924 and was living there with his parents in 1930. E. Son Adolfo Molinar was born in Terlingua in 1925. In April 2008 he was living in San Mateo, California. F. Son Jose Molinar was born in Terlingua in 1928. He was deceased by April 2008. G. Son Cruz Molinar was born May 3, 1933 in Brewster County. In April 2008 he was living in Presidio, Texas. H. Daughter Consuela Molinar was born February 2, 1939 in Brewster County. In February 6, 2000 she was living in Odessa, but by April 2008 she was deceased. Her married name was Machuca. (1) Daughter Rosa Almodova was born November 5, 1945. (2) Son Joe Almodova, Jr. was born May 2, 1947. (3) Daughter Amanda Almodova was born November 28, 1948. B. Son Victoriano Chavez was born March 5, 1930 in Terlingua. He was delivered by his grandmother, Severa Chavez. C. Son Roberto Chavez was born September 10, 1934 in Terlingua. He died in Terlingua July 26, 1936 and was buried there the following day by his father. 7. Daughter Micaela Chavez was born in Lajitas, Texas January 5, 1904 and was baptized there by Father Brocardus April 29, 1904. Her godparents were Jose Herrera and Maxima Chavez. She married Jose Galvan in Terlingua December 28, 1924. The ceremony was performed by Father Salvador M. Giran of St. Agnes Catholic Church in Terlingua and the witnesses were Tomas Lujan and Jesusita Gonzalez. Jose was the son of Victoriano Galvan and Feliciana Martinez. He was born in Santa Rosalia, Chihuahua, Mexico. Jose worked for the Chisos Mining Company, employee number 387, from at least March 1925 until his death in 1935. He died of tuberculosis in Terlingua August 29, 1935 and was buried in the Terlingua Cemetery the following day. After Jose’s death, Micaela moved to Alpine. She remained there until 1946, when she moved to Artesia, New Mexico. There she married Hilario Brito in November 1945. They had no children. Hilario died in 1976. Micaela died in Artesia February 22, 2007. A. Daughter Maria Galvan married Alfredo Leyva. B. Son Jesus Galvan. He was deceased by February 2007. C. Son Jose Galvan, Jr. In February 2007 he was living in Modesto, California. E. Daughter Aida Galvan was born November 15, 1934 in Terlingua. In February 2007 she was living in Artesia, New Mexico. Her married name is Bejarano. (a) 1856 in marriage record, 1858 in death record. (b) Recorded in St. Agnes, Terlingua church records, but specific site not given. Study Butte Mining Company records, W. Keesey Collection, Archives of the Big Bend, Sul Ross State University, Alpine, Texas. Chisos Mining Company Records, Wayne Cartledge Collection, Archives of the Big Bend, Sul Ross State University, Alpine, Texas. Ramon Fuentes Chavez obituary, USGenWeb Archives Project, Ector County. Marriage records from St. Agnes Church in Terlingua, available on microfilm from the L.D.S. Church. Baptism records from St. Joseph’s Catholic Church in Fort Davis, Texas, copies held by the Archives of the Big Bend, Sul Ross State University, Alpine, Texas. Chisos Mining Company Records, Peter Koch Collection, Archives of the Big Bend, Sul Ross State University, Alpine, Texas. Manuel C. Molinar obituary, USGenWeb Archives Project, Ector County. Maria Esperanza Grado obituary, Alpine Avalanche, April 14, 2008. Louisa Madrid family research, including telephone interviews with Mary Holguin and Ida Bejarano.